Hadelich is a singularly gifted, characterful musician who has a flair for bringing older music into the present tense. […] I first heard him at Marlboro Music, the summer gathering in Vermont, in 2008, when he was one of many young musicians receiving guidance from Marlboro’s elders. In the past decade, he has entered the upper echelon of the violin world; he has made a vital, intensely musical recording of Paganini’s Caprices, a peak of the repertory, for the Warner Classics label. […] When Hadelich first came on the scene, he was noted for his pinpoint brilliance and for his sweet, cultured, almost old-fashioned tone. It was as if a Golden Age violinist had jumped out of the grooves of a 78-r.p.m. record. In recent years, he has been emphasizing more modern fare: the brooding concertos of Britten and Shostakovich; the avant-virtuoso works of György Ligeti and Thomas Adès. […] The main event was, however, Hadelich’s performance of the Britten concerto. Dressed in black with an upturned collar, the violinist looked a bit like a young officer in a period film, about to go off to war. The solo part is ferociously demanding, but not necessarily in a way that conveys fireworks to the audience. […] Over three performances—I saw the first two in the hall, the last on the Webcast—Hadelich plumbed the work’s difficulties and ambiguities, finding subtly different solutions each time. At the morning show, Saraste kept to a fairly strict tempo, limiting Hadelich’s ability to tug at Britten’s free-floating lines; yet the second movement had an anxious, sweaty force. That evening, a more languid atmosphere prevailed in the orchestra, allowing Hadelich to savor the Spanish rhythms that course through the score. To judge from the Webcast, the final rendition was the most polished in the series, but each had its virtues. […] At all three performances, the ending of the Britten had a darkly enchanting effect. Over thirty-three slow bars, Hadelich and the orchestra attempt to find their way to a hopeful closing chord of D major. Hadelich eventually lands on F-sharp, the clinching note of the D-major triad, but, by the time the orchestra has joined him there, he seems to have lost faith in that note, and keeps falling back to F-natural. Ultimately, he trills between the two notes while winds and brass hold the bare fifth D-A. All fade to silence. It is impossible not to think about the fact that Britten finished the concerto in the summer of 1939, as the world trembled on the edge of catastrophe. If a layer of surface noise were added to Augustin Hadelich’s recent solo-violin recording on the Avie label, you might think you were hearing a virtuoso out of the Golden Age. Hadelich, who is twenty-five, has all the fast-fingered brilliance that modern conservatory culture requires; the musicality and the freewheeling fantasy that he brings to bear, though, cannot be taught. With the pianist Rohan De Silva, Hadelich gave a riveting recital at the Frick on Dec. 13, in which he ranged from Beethoven’s Sonata in G Major, Op. 30, No. 3, to showpieces by Sarasate and Ysaÿe, and on to Prokofiev’s Second Sonata and Alfred Schnittke’s First Sonata, from 1963. The crucial thing was the command of color: luminous sweetness in Beethoven and Prokofiev, a wide, ruddy tone in Sarasate’s “Carmen Fantasy,” and savage sounds for Schnittke, including something like electric-guitar fuzz. 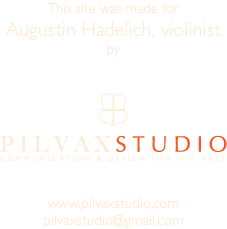 Hadelich shows similar versatility on the Avie disk, combining classic and modern fare. Here is a young artist with no evident limitations.